The Hall of Fame completely reimagines how inductees are presented in the Rock & Roll Hall of Fame. The Rock & Roll Hall of Fame is getting ready to shine in the spotlight when its induction ceremony returns to Cleveland next month. Adding to the Rock Week excitement, the new Hall of Fame, an entire floor celebrating Inductees, opens April 7 during Celebration Day at the Museum with free admission. It cranks up the fan engagement and gives Rock Hall visitors a chance to voice their choice for who should be in the Rock & Roll Hall of Fame. The new experiences cap off the latest phase of the Rock Hall’s multi-year, multi-million-dollar transformation, which included the opening of the Power of Rock Experience in the Connor Theatre this past summer. 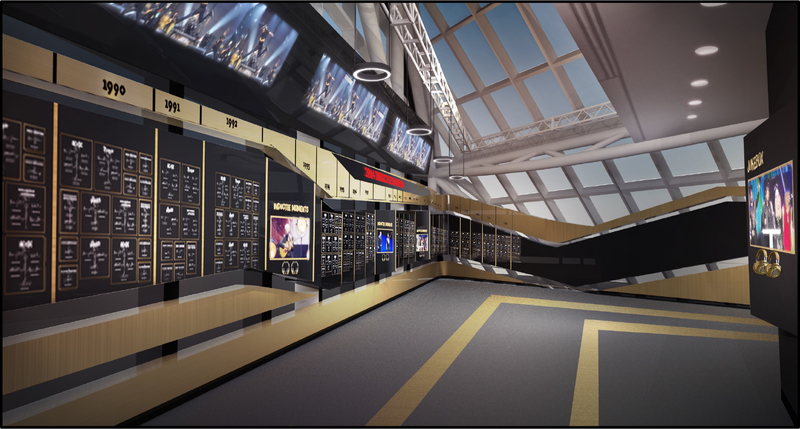 A rendering of the Inductee Signature Wall and interactive displays inside of the Hall of Fame.